While the “much weaker West” did nothing to stop Islamic State of Iraq and Levant (ISIL) in Syria it was ultimately Russian firepower that “made the difference,” Syrian President Bashar Assad said. “In the past if I said anything, people would say the Syrian president is disconnected from reality. Now it’s different. 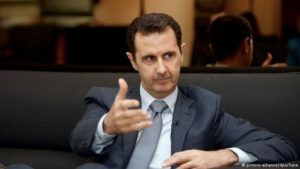 The West is becoming much weaker,” Assad said in an interview published in the British Sunday Times and quoted by AFP. Assad doubled down on his vow to defeat rebel forces in Aleppo. Assad and his supporters use the word “terrorists” to describe all rebel groups – jihadist or otherwise – trying to oust him from power. Asked if he could sleep with the knowledge of the children being killed every day in Aleppo and elsewhere, Assad laughed and said, “I know the meaning of that question. I sleep regular, I sleep and work and eat normal and do sports,” he stressed.